The Divine Service is the most important thing that happens every week at Grace. In the Divine Service, Jesus is the One who serves us (Matthew 20:28). Through confession and absolution (John 20:22-23), through the reading and preaching of His Word (Isaiah 55:10-11), and through his true body and blood given in the Sacrament of Holy Communion (Matthew 26:26-28; 1 Corinthians 11:23-29), Christ himself forgives our sins. Using the orders found in Lutheran Service Book, the Divine Service follows the historic liturgy of the universal Christian Church. This liturgy dates back to the earliest Christians and pulls its words directly from Scripture. Everything that happens in the Divine Service is intended to point us to Christ crucified (1 Corinthians 2:2). The hymns we sing help us to praise God as we use words from Scripture to repeat back to Him what He has done for us in Christ (Colossians 3:16). Through the Divine Service, God builds us up into the Body of Christ (1 Corinthians 12:12-13). Here we enjoy the greatest fellowship with each other, and we leave to serve our neighbors at every opportunity (Colossians 3:17). 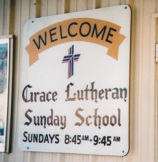 Sunday school classes are available for preschool children through adults. Children's Sunday school classes focus on one of the Bible stories read in the Divine Service, following the CPH curriculum, "Growing in Christ." Our adult Bible study is currently working through the Gospel of Matthew, drawing on the rest of Scripture as well to enhance our faith and understanding. 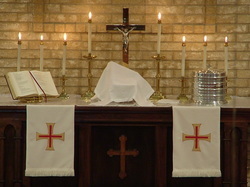 On Wednesdays during the school year, we gather as a congregation for a time of Christian eductation. We begin with dinner at 6:00 PM. Classes are taught for preschool children through adults from 6:30 to 7:30 PM. Together we grow in faith toward Jesus and in love to each other and the world! During the penitential seasons of Advent and Lent, midweek worship services are offered on Wednesday evenings at 7:00 PM in order to help us prepare for the celebrations of Christmas and Easter. Special services are held on Christmas Eve (7 PM), Christmas Day (9 AM), and Easter Sunday (8 AM). We also have special services for other festivals of the church, such as Maundy Thursday, Good Friday, and the Ascension of Our Lord. Check our website during the appropriate season for an up-to-date worship schedule. This group is open to all men of the congregation as a way to support the work of the congregation and Jesus' mission in our community. Join their meetings on the second Monday of every month for a delicious meal, a helpful Bible study, and a short time to discuss how to further the work of the church. The LLL in our congregation began in 1947. Lutheran Hour Ministries, the media outreach arm of the International LLL, uses TV, radio programming and other outreach tools, to equip the laity in North America and around the world. For more information, visit their website. 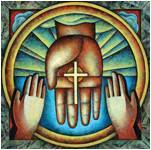 ​The Lutheran Women’s Missionary League is the official women’s auxiliary of The Lutheran Church—Missouri Synod. For over 65 years, the LWML has focused on affirming each woman’s relationship with Christ, encouraging and equipping women to live out their Christian lives in active mission ministries and to support global missions. Every summer, we offer a themed VBS that focuses on teaching children the good news about salvation by grace through faith because of what Jesus has done for us. VBS classes are for children preschool through 6th grade. Middle school students, high school students, and adults help to tell the children about Jesus and lead them in activities like music, games, crafts, and snack. Each evening we begin with a light meal. During the Divine Service the Sunday after VBS, the children and teachers are invited to share with the congregation some of the songs they learned during the week.